What Element is Atomic Number 5? Boron is the element that is atomic number 5 on the periodic table. It is a metalloid or semimetal that is a lustrous black solid at room temperature and pressure. Here are some interesting facts about boron. Boron compounds form the basis for the classic slime recipe, which polymerizes the compound borax. The element name boron comes from the Arabic word buraq, which means white. The word was used to describe borax, one of the boron compounds known to ancient man. A boron atom has 5 protons and 5 electrons. Its average atomic mass is 10.81. Natural boron consists of a mix of two stable isotopes: boron-10 and boron-11. Eleven isotopes, with masses 7 to 17 are known. 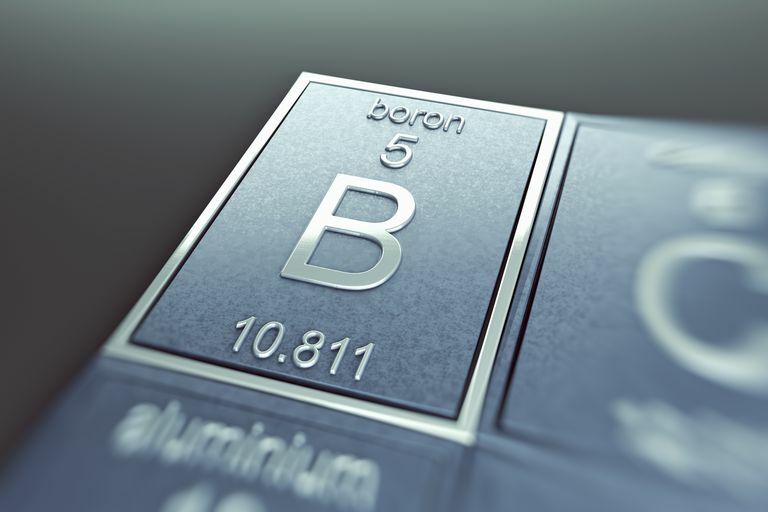 Boron exhibits properties of either metals or nonmetals, depending on the conditions. Element number 5 is present in the cell walls of all plants, so plants, as well as any animal that eats plants, contain boron. Elemental boron is non-toxic to mammals. Over a hundred minerals contain boron and it is found in several compounds, including boric acid, borax, borates, kernite, and ulexite. Yet, pure boron is extremely difficult to produce and the element abundance is only 0.001% of the Earth's crust. Element atomic number 5 is rare in the solar system. In 1808, boron was partially purified by Sir Humphry Davy and also by Joseph L. Gay-Lussac and L. J. Thénard. They achieved purity of about 60%. In 1909 Ezekiel Weintraub isolated nearly pure element number 5. Boron has the highest melting point and boiling point of the metalloids. Crystalline boron is the second hardest element, following carbon. Boron is tough and heat resistant. While many elements are produced via nuclear fusion inside stars, boron is not among them. Boron appears to have been formed by nuclear fusion from cosmic ray collisions, before the solar system was formed. The amorphous phase of boron is reactive, while crystalline boron is not reactive. There is a boron-based antibiotic. It is a derivative of streptomycin and is called boromycin. Boron is used in super hard materials, magnets, nuclear reactor shielding, semiconductors, to make borosilicate glassware, in ceramics, insecticides, disinfectants, cleaners, cosmetics, and many other products. Boron is added to steel and other alloys. Because it is an excellent neutron absorber, it is used in nuclear reactor control rods. Element atomic number 5 burns with a green flame. It can be used to produce green fire and is added as a common colorant in fireworks. Boron can transmit part of infrared light. Boron forms stable covalent bonds rather than ionic bonds. At room temperature, boron is a poor electrical conductor. Its conductivity improves as it is heated. Although boron nitride is not quite as hard as diamond, it is preferred for use in high temperature equipment because it has superior thermal and chemical resistance. Boron nitride also forms nanotubes, similar to those formed by carbon. However, unlike carbon nanotubes, boron nitride tubes are electrical insulators.